I am looking forward to the power of the full moon shortly, can you feel the energy increasing? 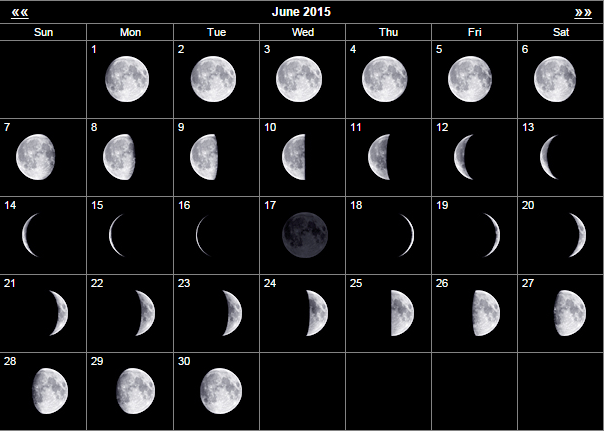 Here are the moon phases for June 2015 for you so that you can plan your month accordingly. Living life within the phases of the moon allows your life to flow with much greater eases. As the moon wanes during the first week in June try to spend the time withdrawing a little, contemplating more and perhaps de cluttering your life a little. 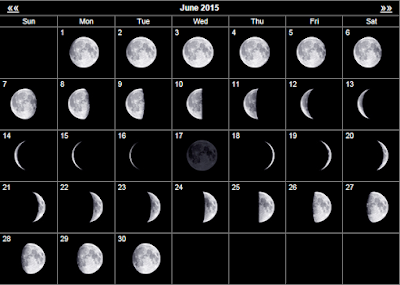 At the new moon on the 18th June this is a perfect time to start new projects and as the moon waxes during the second half of June you may find you have more energy so use that energy to push projects forward, connect with friends and family and be creative. This moon in June was popularly called the Strawberry Moon or Rose Moon because of the time of the year. This full moon was seen as very spiritual by Buddhists as it was the full moon when Buddha died and received enlightenment. Bright Moon, Seed Moon and Planting Moon are other popular names. Our ancestors lived their lives a lot more in tune with the moon and we have much to learn from their cultures.